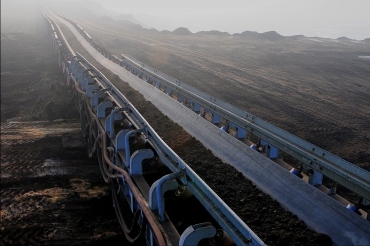 Conveyor belts with steel cords, non-inflammable T-ST, are designed for transportation of loose materials in the condition of increased fire danger at work on the surface – for example, transportation of coal in power plants, coking plants, mines processing plants and ports. The belts are made of a core consisting of longitudinally arranged zinced steel cords vulcanized in a special non-inflamable core rubber and rubber covers. Due to the properties of the steel – rubber core of the T-ST belts, such belts are recommended for use on long and sloping routes, where extremely low elongation, long life and low failure are required.